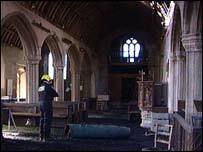 A fire is thought to have caused thousands of pounds damage to one of Cornwall's oldest churches. 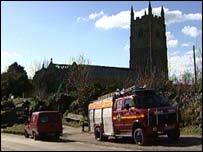 Emergency crews were called to the Lansallos Church, near Polperro, late on Saturday afternoon. About 45 firefighters tackled the blaze and managed to save 60% of the roof on the 14th Century building. No-one was injured in the incident, but police described it as "serious and suspicious". An investigation into the cause of the fire is under way. Polruan Station Officer Peter Ripley said the crews were well aware of the historical importance of the Grade I Listed building and its contents. He said: "We did try to salvage a lot of stuff. "Much of it is irreplaceable and we were quite concerned about it, but we're pleased with what we did." The church can seat 150 and one of its outstanding features is its medieval pews - carvings on the bench ends were mostly done between 1490 and 1520. Because they are not fixed pews, successful efforts were made to move them away from the seat of the fire to save them from worse damage. It is believed that the fire began in the north aisle behind the organ. Smoke has caused severe damage throughout the building. Jeremy Dowling, from the Diocese of Truro, said: "Until insurance assessors, the police and fire officers have completed their investigations, it is not known what caused the fire at Lansallos, nor the full extent of damage and likely cost of repairs. "The church, which is currently without a parish priest, serves a rural area with a scattered population of around 400."